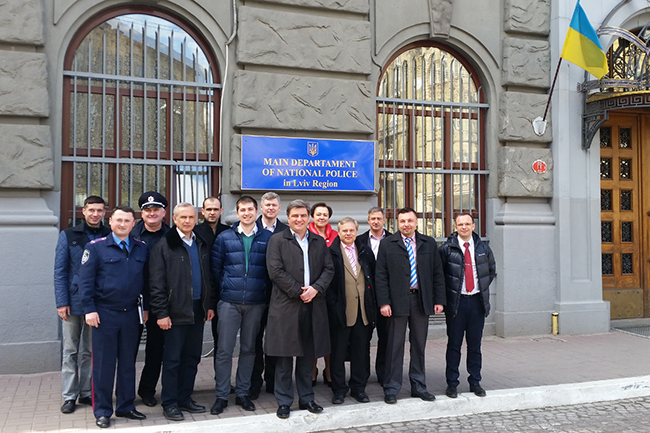 EUAM experts held a workshop in Intelligence Led Policing in Lviv yesterday for officers of the Lviv Main Department of the National Police (MDNP) and members of the new Patrol Police. They were joined by officers of the Kharkiv National Police who presented a new intelligence analytics software, marking the first time that EUAM has carried out a joint presentation with a Ukrainian police force for colleagues in another oblast. The workshop focused on how to move from a data driven approach to an intelligence led approach. The processes which compose the intelligence cycle were debated and explained, as well as intelligence products. This was the third time that EUAM has delivered the Intelligence Led Policing workshop in Ukraine – last year it was held in Dnipropetrovsk and Zaporizhya. A novelty was the inclusion of NPU officers from Kharkiv, who presented the Real-time Intelligence Crime Analytics System (RICAS). This is a new analytical software system, which has been developed and implemented in Kharkiv in the last six months. It is an intellectual system of visual criminal analysis, which has been developed using the most recent methods, models and techniques to analyse criminal information, including hidden patterns.